Full climate models are designed to be as close to nature as possible. They are representations of the combined knowledge of climate science and are without a doubt the best tools to understand what the future might look like. 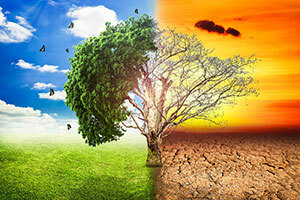 However, many research projects focus on small parts of the climate, such as sudden wind changes, the temperature in a given region, or ocean currents. For these studies, concentrating on a small detail in a full climate model is like trying to find a needle in the haystack. Here’s an example. In a paper from last year I looked at the temperature and wind changes in the upper atmosphere close to the Equator. I didn’t need to know what happened in the ocean, and I didn’t need any chemistry, polar ice, or even clouds in my model. So I wrote a much simpler model without these ingredients. It’s called “MiMA” (Model of an idealised Moist Atmosphere), and is freely available on the web. Of course, using simpler models comes with its own problems. The main issue is that researchers have to be very clear what the limits are for each model. For instance, it would be hard to study thunderstorms with a model that doesn’t reproduce clouds. The second issue is that whereas the scientific results may be published, the code itself is typically not. Everyone has to believe that the model does indeed do what the author claims, and to trust that there are no errors in the code. The third issue with simpler models is that anyone else trying to duplicate or build on published work would have to rebuild a similar model themselves. But given that the two models will be written by two (or more) different people, it is highly unlikely that they will be exactly the same. Also, the time the first author spends on building their model is then spent a second time by a second author, to achieve at best the same result. This is very inefficient. To remedy some (if not all) of these issues, some colleagues and I have built a framework of climate models called Isca. Isca contains models that are easy to obtain, completely free, documented, and come with software to make installation and running easier. All changes are documented and can be reverted. Therefore, it is easy for everyone to use exactly the same models. The time it would take for everyone to build their own version of the same model can now be used to extend the existing models. More sets of eyes on one model means that errors can be quickly identified and corrected. The time saved could also be used to build new analysis software, which can extract new information from existing simulations. As a result, the climate models and their resulting scientific experiments become both more flexible and reliable. All of this only works because the code is publicly available and because any changes are continuously tracked and documented. An example is my own code, MiMA, which is part of Isca. I have been amazed at the breadth of research it is used for. I wrote it to look at the tropical upper atmosphere, but others have since used it to study the life cycle of weather systems, the Indian monsoon, the effect of volcanic eruptions on climate, and so on. And that’s only one year after its first publication. Making models openly available in this way has another advantage. Using an accessible proof can counter the mistrust of climate science that is still prevalent in some quarters. The burden of proof automatically falls on the sceptics. As all the code is there and all changes are trackable, it is up to them to point out errors. And if someone does find an error, even better! Correcting it is just another step to make the models even more reliable. Going open source with scientific code has many more benefits than drawbacks. It allows collaboration between people who don’t even know one another. And, most importantly, it will make our climate models more flexible, more reliable and generally more useful.